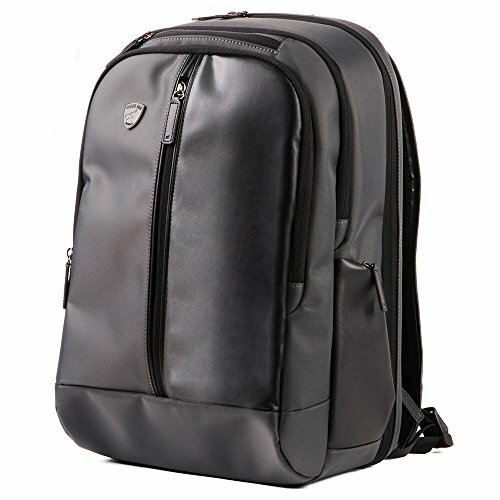 The Guard Dog ProShield Pro Backpack is a sophisticated, finely designed backpack from the leading manufacturer of security, self-defense and tactical products. Lab tested and Level IIIA certified by the National Institute of Justice, the backpack’s lightweight interior armor protects against .44 magnum and 9 millimeter impact. Light and comfortable to carry, the ProShield Pro is an ideal choice for daily use. With meticulous attention to detail, the backpack’s high quality finish conceals over 20 compartments to keep your belongings organized and easily accessible. Perfect for travelling, the TSA-approved quick-open back holds an 18 inch laptop and tablet, which can remain in their expandable sleeves for security screening, and a convenient luggage sleeve attaches onto your luggage handle. A concealed gun holster holds most handguns in an accessible back pocket, and prevents bulging and movement, and an RFID blocker pouch protects your identity and information. With quick access front and side pockets for wallets, sunglasses and keys, the backpack also has a retractable handle that zips closed when not in use. Weighing just ounces more than an unarmored backpack, the Guard Dog ProShield Pro features an ergonomic back for premium airflow and adjustable padded straps for comfortable carrying. Industry-leading Guard Dog Lifetime Warranty. If you’re not happy with your backpack, simply swap it out, no questions asked. Your Guard Dog product has a lifetime warranty, so you’re always protected. Stay Protected. Buy your Guard Dog ProShield 2 Backpack today! TRAVEL LIKE A PRO: TSA-approved quick-open back eliminates the need to remove laptop and tablet during security screenings, and an RFID blocker pouch secures your private information. MULTIPLE COMPARTMENTS: Over 20 convenient storage pockets including expandable sleeves for an 18 inch laptop and any available tablet. The luggage handle sleeve allows you to stow your bag onto your carry-on luggage.